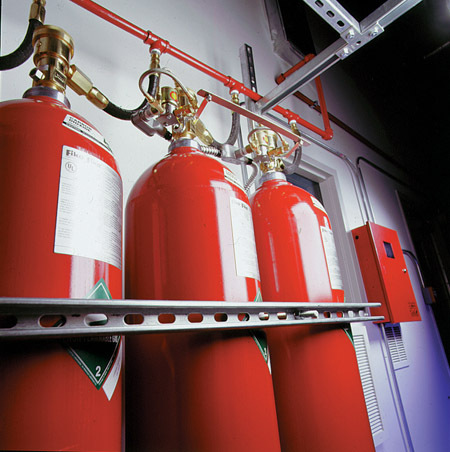 Reliable Fire has the right fire suppression system to meet your needs The codes of the National Fire Protection Agency (NFPA) govern fire suppression systems in the United States. They cover a variety of industries and facilities depending on the hazards that are present. Protecting lives and property are the main purpose for these standards. Typically, fire suppression systems deliver a fire-extinguishing agent from a storage container to a defined protected area through a fixed-pipe network. The detection systems use specific detectors that respond to one or more characteristics of fire such as smoke, flame, heat, or other products of combustion. The selection of the proper detectors is a key to the success for fire extinguishing systems and determined by many factors including the ignition source, fuel and space being protected. The professionals at Reliable Fire & Security have the industry experience to help customers determine the fire suppression systems they need. We manage the project from design and installation services to inspection and maintenance. Once the system is installed, it must be maintained, at least annually in order to ensure the system remains properly functioning. Keeping the areas free of dust and debris may play a role in how the system continues to operate. This is why it is important that professionals inspect each part of the system. These systems are designed to work without human intervention. The systems are able to sense the fire and send a signal to alarm any humans in the area. This provides the opportunity for anyone to vacate the premises. In a fire suppression system, the fire is usually detected mechanically or electronically. Fusible-link or thermo-bulbs are mechanical detectors while electrical methods utilize a heat sensor. Remote and local manual operation is also possible. Upon detection, the actuation component of the system fills the piping with a pressurized fluid. Once the pipes are filled with the fluid, the nozzles deliver the agent to the area where the fire is burning.